A lot of people were watching today. People all over the Capital Region watched the inauguration today. And thanks to Twitter, we can (sort of) hear what they were saying/thinking. The ceremony seemed to hearten a lot of people. Obama's speech made @warhorus "feel good about my country again." @kinthedell was inspired. @albanytuarts reports the 250+ people watching at Proctors gave the speech a standing ovation. Some were moved to tears. @tenner snapped a pic of the crowd there. As @esposj noticed, they weren't many people working during the ceremony. (Well, maybe some people were.) And the fact that some weren't didn't go over well. @Astrogirl426 loves it that Obama hugs other men. The new president's lefthandedness caught the attention of @amezri, @techcommdood and @aimodestructo. @Kristi Gustafson thought Michelle Obama's outfit looked "like she cut apart curtains!" But @SiobhanK524 liked the dress. From @lnorthrup: "On Day One, everything changes. ....no, wait, that was someone else." I stand by my defense of Michelle's dress. That color is WAY difficult to pull off, and she did it flawlessly. I am proud to welcome her as America's Next Top First Lady. 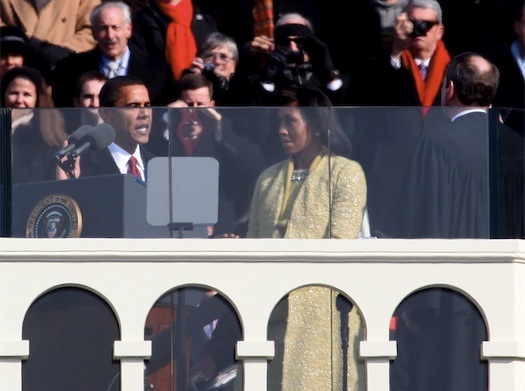 I also found Barack's speech incredibly moving and the entire ceremony riveting... but come on, it's Twitter. I'll save the lengthy analysis for a different platform. The dress is pretty nice. It helps a woman in that position to NOT be too stylish. If she looks glamorous it's like she's above us, whereas something even a touch frumpy makes her look human. I was on the Mall for the inauguration, and her dress went over extremely well in our section. However, it should probably be noted that DC is notorious for its lack of fashion prowess. God, I wish I went to Proctors. I made the mistake of watching the inauguration at my new-age mothers house. The only way she felt she could properly express her excitement was through an interpretive dance in front of the television. The good news is that, according to my mom, Obama is going to be a great president. Why? He's got a beautiful aura. Take that to the bank, America!